What Are Columns and Rows? Columns and rows are a fundamental part of any spreadsheet program, whether it's Microsoft Excel, Google Sheets, OpenOffice Calc, LibreOffice Calc, or some other software. Spreadsheets are organized in a workbook by worksheets, and within each worksheet is a collection of cells where data resides. The cells of a spreadsheet are positioned in a grid pattern via columns and rows. 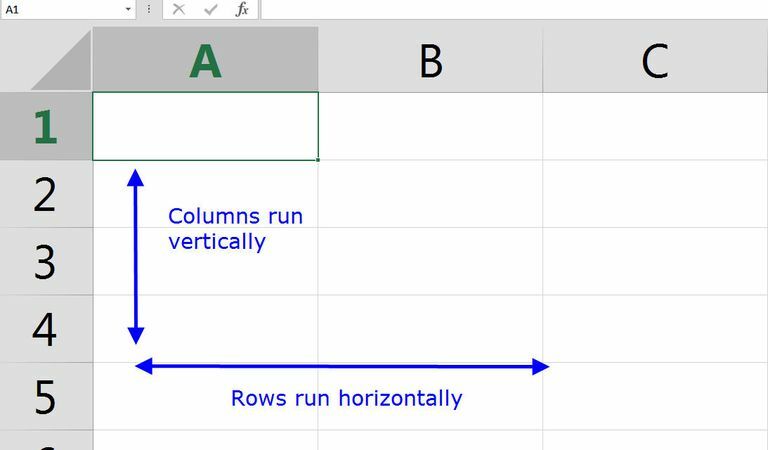 Mixing up the definition of rows and columns is easy, but knowing the difference is important when learning how to structure a spreadsheet or when following a tutorial. Columns run vertically, up and down. Using the image above, we can see that A, B, and C are columns because they're located at the top of the spreadsheet. They're there to align the cells below them. Most spreadsheet programs mark columns headings with letters. Rows, then, are the opposite of columns and run horizontally. The rows in our image include 1, 2, 3, 4, and 5. One easy way to remember the difference between columns and rows is to think about real-world scenarios. A column on a building is a large, vertical pillar, while the rows of a corn field are long aisles. The standard way to talk about any specific cell in a worksheet is to explain its column and row since that's the only way the cells are organized. For example, to refer to a cell in Column G that's in Row 15, you'd say G15. The column always goes first followed by the row, without a space. This naming convention is true not only in word of mouth and writing but when making formulas in a spreadsheet. For example, using =sum(F1:F5) in Google Sheets explains to the spreadsheet program to take the sum of F1 through F5. When you first open a spreadsheet software program, there's a default number of rows and columns built-in. For example, Google Sheets starts off with 26 columns and 1,000 rows. Because there are only 26 letters in the alphabet, spreadsheet programs need a way to place a value on a column beyond No. 26 (Column Z). To do this, column names are normally appended with the start of the alphabet again. For example, Row 26 might read AA, Row 27 AB, and so on. However, most programs put an upper limit to how many rows and columns can exist in any one spreadsheet. Google Sheets, for example, doesn't let you make any more than 18,278 columns, but there's no limit on rows. Excel worksheets are limited to having 16,384 columns and 1,048,576 rows. In Excel, the very last column heading is called XFD to indicate Column 16,384. To highlight an entire column in Excel or Google Sheets, click the column header letter(s) or use the Ctrl+Spacebar keyboard shortcut. Selecting a whole row is similar: click the row number or use Shift+Spacebar. 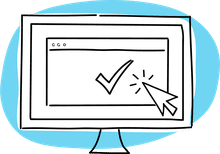 To navigate through a worksheet, you always have the option to click cells or use the scroll bars on the screen, but when dealing with larger worksheets, it's often easier to use the keyboard. Hold the Ctrl key and then press a directional key (e.g., down, up, right, or left) to quickly move the active cell in that direction. For example, use Ctrl+Down to immediately jump to the last visible row in that column or to the next cell in that column that has data. See Google Docs Editors Help for more keyboard shortcuts you can use in Google Sheets for Windows, macOS, Chrome OS, and mobile devices. Microsoft has lists of Windows keyboard shortcuts and Mac keyboard shortcuts.